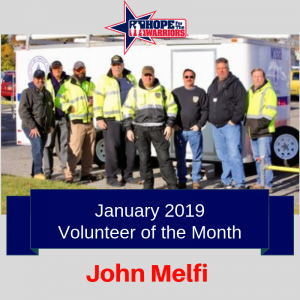 We are excited to announce John Melfi as our first Volunteer of the Month in 2019! John is the Radio Officer and Emergency coordinator for the Town of Babylon and the president of the Great South Bay Amateur Radio Club. He first was introduced to Hope For The Warriors, 11 years ago through the Long Island Run For The Warriors. Yearly at the run, John and amateur radio operators, volunteer their time spreading the word about our Long Island race through public service announcements and on race day, they establish reliable communication from the course to emergency service and race officials, as well as, assist with barricade placement. All of these functions are critical to the success of the race! John’s continuous support of our race is fueled by his belief that supporting our nation’s warriors and honoring those who never made it back home is, “what we should do,” which is a common thread that unites all Long Islanders. John is also inspired by the service of his colleagues, friends, and families, specifically a member of the Great South Bay Amateur radio club that is currently serving in the Middle East, his uncle that served in the Marines, and a fellow member of his brass ensemble. To John, “there is nothing better than chatting with a veteran and hearing their story and having the opportunity to thank them for their service,” a gesture to be emulated. Thank you, John, for not only your support of the Run For The Warriors Race Series but for all that you do to serve and support your community and honor your veteran and military family neighbors! We are proud to have you as a part of our HOPE family!